Since everyone has a bit of each of the four primary factors, it is important to understand that the mix of levels or elevations determines how much governance each of these four factors will have over your behavior. In this session, we are going to talk in depth about the Steadiness factor’s potential positive impact and how you can dial up its effects. As with all of the factors you begin determining how to adjust them by first asking yourself: When is it appropriate to dial Dominance, Influence, Steadiness or Compliance up or dial it down? Remember our warning of caution regarding ethics: By situationally adjusting your Steadiness factor, you must make certain that you are using it to make the situation better. Never plan to use any of your growing abilities to situationally adapt your behavior in a scheming, calculating way and always think of Noble Intent. In some situations, you have to learn how to dial up your Steadiness when you are working alone. You may need to alter the depth of your thinking or the pace you are operating at, or you might need to dial it up in groups to make sure the decision-making processes have adequate thoughtfulness or that people are considering all the options appropriately. The situation you find yourself in may call for increased patience and persistence, for which you must consciously make an effort to dial up your Steadiness factor governing power. The Steadiness factor is the factor to turn to for thinking through situations, becoming committed to responsibilities, and becoming more empathetic to other people. This is a great factor to learn to dial up if you are a manager, coaching at work or in social situations, or are a salesperson because you can better understand the needs of your employees or clients and effectively function in each situation. As you learn how to dial up your Steadiness, put extra consideration on how to pick up the positive qualities of this factor while avoiding its weaknesses. Specifically, do not let the Steadiness factor cause you to be resistant to change or to be passive aggressive. We want to ramp up the strengths of the Steadiness factor to enhance our thoughtfulness, persistence, and patience. Remember that there are three perceptual positions to any situation you encounter. The first perceptual position is your point of view. It is what you perceive and believe. The second perceptual position is the alliance position, where you see the situation from the point of view of the others involved. The final perceptual position is the observer or the fly-on-the-wall position. This is from an objective viewpoint regarding the situation. Learn more about the Perceptual Prism in Session 3 of the Change Course. This may seem difficult to do, but think about how others are feeling and about an objective view without emotional involvement. Think about how a new change or decision affects others. Our first instinct is to think about how this affects ourselves, but think about how this may change things for others. Think about the people involved and what this new change may mean for them. By putting yourself in someone else’s shoes, you are now one-step closer to being able to look at a situation objectively. When a person is in the third position, they are able to make decisions for the good of the group, not just for the individual. For instance, a manager has two proposals to choose from and chooses proposal A because they like the way it looks and/or because their team is used to working with the company who submitted the proposal. Proposal B happens to be significantly less expensive than proposal A and offers more features, but because the manager is making their decision from the first or second perceptual position, the correct decision is not made. If the manager took a step back and looked at both proposals from the third perceptual position, they would be able to make an unbiased, unemotional decision that would benefit the company and employees. The ability to look at situations through the different perceptual positions is a great strength of the Steadiness factor. The best way to dial up your Steadiness factor is to have a holistic approach to the responsibilities, accountability metrics, and the authority parameters that are involved with a task or assignment – whether this is at work or in any other areas of your life. A parent can use the RA2 Document around the house to set up chores and make sure the family knows who is accomplishing what tasks. Alternatively, the coach can use the RA2 document to set up responsibilities and accountability metrics for their coaches. Because the Steadiness factor is acutely aware of the intricacies and consequences of decision-making, the RA2 Interface Document can help carve out that picture for you so that you can properly manage your time and effectively produce the needed results according to your and other people’s expectations. Further, then just defining the responsibility, accountability, and authority areas of a task in a work environment, the RA2 Interface Document represents how to delegate authority with dotted and solid lines, who is in the communication loop, and what the legal, moral, and ethical constraints are. This is an invaluable tool for aligning your organization or team to become more cohesive and effective along horizontal and vertical lines. Whenever I work in a team setting, my first goal is to fill out the RA2 Document and make sure we all understand our responsibilities. This makes us a more cohesive unit when we know to whom we can delegate to, who we can communicate with for more information, and what metrics we have to achieve. It makes sure no surprises come through at the end or people on the team say they did not fully understand what was being asked of them. Review the RA2 Interface Alignment Course for a full description of how to receive the benefits from this method. Another component of the Steadiness factor is the pace you operate at and your degree of persistence. The inconsistent pace is a sign of a low Steadiness factor and happens when someone multitasks, procrastinates, and is easily distracted. This step can help you work and live at a more consistent pace by understanding the Law of Commitment and the Law of Consistency. The Law of Commitment states that people are more likely to listen and trust a person if they see that person taking action directed at achieving their goals. Bottom line: Actions speak louder than words. The Law of Consistency states that people are more willing to trust someone who is stable and predictable in their behavior. When people jump from project to project and do not stick with what they are doing, they are working at an inconsistent pace which is detrimental to their performance and influence. The inconsistent pace is mainly due to having a lower Steadiness factor. This factor is responsible for persistence and the ability to keep on track with a project or activity. Use Steadiness to stay with your project and see it through. If you need to, take a break, but get back on track quickly. Now let’s look at the story of Cal Ripken Jr.
On September 6th, 1995 in front of a sold-out, screaming crowd at Oriole Park at Camden Yards, Cal Ripken Jr. broke a record that had stood for 56 years in Major League Baseball. On that night, Cal played in his 2,131st consecutive game, breaking the record set by the great New York Yankees first baseman Lou Gehrig. He went on to play an additional 501 straight games after setting the record, and in 1998 he voluntarily took himself out of the lineup after playing in 2,632 consecutive games. Known as the Iron Man, Cal’s streak stretched from 1982 to 1998 and during that time, he made the All-Star team sixteen times, was a two time Gold Glove Award winner, and a two time Most Valuable Player Award winner. In 2007 he was inducted into the Major League Baseball Hall of Fame. His consistency and persistence is an example of how sticking to what you are doing and staying focused can lead to success. Commit to the responsibilities that you accept in your life. Hold to your promises and achieve the results that you set your sights on. The more you are able to commit yourself to achieving success, inevitably the more success you will find. Review Session 5 entitled The Law of Commitment and the Law of Consistency in the 21 Laws of Influence in Indaba’s Sales eLearning Course. People consider Steadiness individuals as thoughtful and considerate, but just talking to someone does not make you thoughtful or considerate. Before you talk to someone, create an agenda. For example, a salesperson could make it a point to find out something new about an existing customer. By doing this, the salesperson shows that they care about their customer and are serious about continuing the relationship. Take the time to talk to someone and find out something you didn’t already know about them. It is much easier for people to talk about themselves and their interests than other people. This small act of kindness could change someone’s day and make them feel noticed and appreciated. The more you do this, the more considerate and thoughtful you’ll become. As you become more comfortable talking to others, you will find yourself beginning to understand what their motivators are and what their feelings are about topics and issues. You will begin to see the different behavior types associated with people and the way that they respond to various situations. Remember when talking with others that the MOST favorite word a person likes to hear, is their own name. If you get a new project, plan exactly how you will complete it. Planning specifically will naturally dial up your thoughtfulness by causing you to think about the specifics involved in making your plan successful. More importantly, creating a plan enables you to make a roadmap for you to follow and allows you to set deadlines, which will keep you consistent. This will give your plans a greater chance of success. Make a list or a timeline of how you will get things accomplished. Planning and organizing will make you feel like you have more control over things and you’ll feel more relaxed knowing exactly how you’ll accomplish your project’s goals. Strategic plans can greatly benefit your thoughtfulness and your ability to see how your decisions will affect the people around you. Be cautious, however, of creating plans without enough thought. As you continue to use plans over time, you will notice your Steadiness factor growing, helping you to incorporate it into your life. 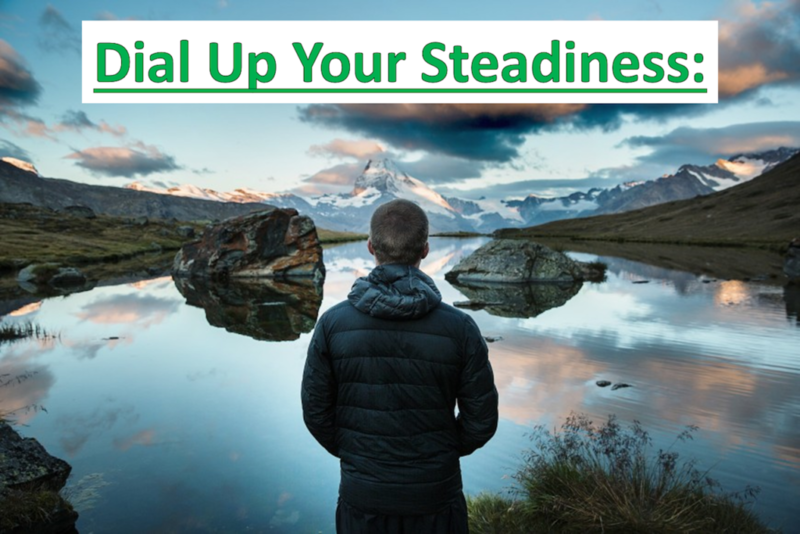 After completing the immediate steps associated with dialing up the Steadiness factor, some secondary steps can help you achieve situational behavioral flexibility of the Steadiness factor. Practice these steps often so that they become second nature to you when you need these skills. As we said in the immediate step, clear definitions of responsibilities, accountability, and authority parameters motivate individuals with the Steadiness factor, which is the ultimate goal for someone who has a low Steadiness factor. If you feel that you have become distracted from your original goals, remember your job description and what you’re expected to do. You may want to ask your boss or superior what exactly they expect of you. If you feel unsure while completing a project, think about the benefits and consequences of why you are doing what you are doing. Think about how to accomplish this better. When you think deeply, you will be more consistent about your pace, the planning process, and the efforts you put in will be more in alignment with the original goals. Take the time to look up those parameters you started with during your goal setting. Do this on a consistent basis to dial up your Steadiness factor. After you define what you are doing, you can then take the extra effort to exceed the expectations given to you. Think about process improvement. Process improvement involves always checking your current position and seeing how you can improve it. Benchmarking and evaluating where you are can help you improve the process you are using to reach your goals. The persistence and determination from the Steadiness factor help you continually exceed the expectations set forth by your bosses, your family, or your friends. Remember, you control the amount of effort you put into improving yourself and your responsibilities. Now let’s look at the story of Peter Ueberroth. Peter Ueberroth was one man who was never satisfied with the status quo. The son of an itinerant aluminum-siding salesperson, Peter went on to become Time’s man of the year in 1985. Ueberroth also built one of the finest travel companies in the United States. His commitment to a personal lifestyle of excellence is reflected in his business practices as well. For example, Ueberroth’s employees wore coats and ties at all times and when an employee looked a little shabby, they were admonished to purchase new threads. Oh yes, Ueberroth customarily provided a check to cover the cost, putting his money where his mouth is. He later spearheaded a tremendously successful twenty-third Olympic games in Los Angeles, California. Unlike the twenty-two that preceded it, this event blasted the status quo of causing huge financial losses and generated a $215 million profit. To top off this effectively orchestrated event, eighty-four thousand people attending the closing ceremonies gave Peter Ueberroth a standing ovation. The difference between the status quo and a standing ovation can be found in a comment by Abraham Lincoln. I do the very best I know how the very best I can; and I mean to keep doing so until the end. This statement accurately describes how Peter Ueberroth ran his company, lives his life, and is an excellent example to follow. Finally, Eliminate the Distractions from your life. Distractions are the enemy of thinking because distractions kill thoughtfulness and pull you away from completing your goals. Having the ability to stay focused on a task or a project can improve productivity and performance. The time and thought, which most people waste in an aimless effort, would accomplish wonders if properly directed with some special object in view. Unless you can concentrate upon the object, which you have in view, you will have but a hazy, indifferent, vague, indistinct and blurred outline of your ideal and the results will be in accordance with your mental picture. Meditation, visualization, and deep breathing techniques can help you stay focused and consistent. Take a few minutes each day to stop what you’re doing and handle the small matters that might prove as distractions later. Close out of your browser, do not respond to text messages or emails, and turn off notifications. You cannot get things done and pay attention when you are giving your time and attention to everything that pops up on your screen. Set aside time during the day to complete any tasks that might later prove as distractions to your work responsibilities. Complete the Eliminate Distractions Activity from the How to Dial Down Friendliness session to help you eliminate distractions. If your goal is to dial up your Steadiness factor to the optimum level, make sure you complete the activities in the activity section. I hope you have enjoyed the steps on how to dial up your Steadiness factor. Be sure to incorporate each of the four primary factors into your life as the situation warrants. Behavioral flexibility is the key to your success.